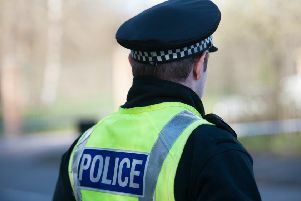 DOG owners have been warned to be on their guard after reports of a spate of possible poisonings in a Dalkeith park. At least one pet is thought to have died this week and others have being ill in recent months after walks in Waterfall Park. Worried owner Craig Stables told the Evening News he suspects someone tried to grab his black Labrador, Seve, on Thursday. “My mum and dad were walking him and he ran off in front a hundred yards or so after sticks and that, and came back without his collar,” said Mr Stables, 38, from Bonnyrigg. Mr Stables, who works at nearby Newbattle Golf Club, said a fellow dog walker who works for the police told of potential poisoning incidents. “There’ve been two or three in the last couple of months. Somebody was saying they’d seen slug pellets dropped on the paths. Other owners took to the What’s On In Dalkeith Facebook page to report cases of pets returning from the park shaking and vomiting. Tracy McShane told how her pet pug, a gift for her son after he recovered from meningitis, died in similar circumstances last year. She said: “My pug was poisoned over there last year, he sadly didn’t make it. He was only two. “I hope they find who ever is responsible for this! Concerned owners have been advised to get toxicology tests on any pet suspected to have been poisoned. But with the potential cost running into thousands of pounds, many cannot afford to get to the bottom of their pets’ mystery illness. Last May, one cat died and another was left seriously ill after being poisoned with antifreeze in Taylor Place, Dalkeith. Anyone found guilty of deliberately poisoning an animal can face penalties of up to six months in prison, a £5,000 fine or both.